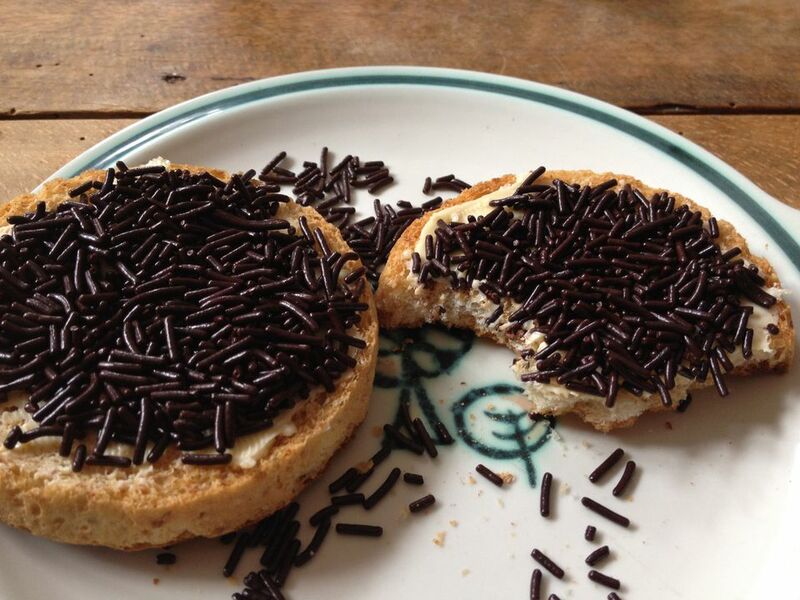 In the Netherlands, hagelslag refers to small pieces of confectionery, similar to sprinkles, which are used as a sandwich topping. Bread is first smeared with butter and then sprinkled with hagelslag. Some say that hagelslag was an Amsterdam invention. It was likely invented by B.E. Dieperink, the Director of a Jordaan-based candy manufacturer, which still exists today as VENCO, but is better known for its other sweets. By 1928, the DeRuijter candy company created their own version of hagelslag. In addition to anise-flavored sprinkles, they offered lemon, raspberry, and orange. In the early years, the sprinkles were packaged in paper cones, but today they are sold in small paper boxes or plastic containers. Chocolate hagelslag, similar to chocolate jimmies in the U.S, was the first mass-produced in the Netherlands in 1936, by Venz, another Dutch confectionery company not affiliated with the Venco company that today produces mostly licorice, peppermint, anise-flavored candies, and other sweets. The only hagelslag that contains at least 32% cocoa can be called chocoladehagelslag, and you will find them in the flavors milk chocolate, pure chocolate and as a mix of pure and white chocolate. Venz is still the only company that can use the term hagelslag, which is why you'll see the only hagel on the packaging of other chocolate sprinkle brands. Today, hagelslag is available in a large variety of colors and flavors including chocolate, anise, and fruit (vruchtenhagel) flavors. Other varieties are sometimes created for holidays and special events, such as pastel-colored hagelslag for Easter and orange hagelslag for major Dutch sporting events or King's Day. Closely related to hagelslag are curly chocolate flakes known as chocoladevlokken. Other popular versions of hagelslag include Blauw en Witte muisjes (blue and white mice), bosvruchtenhagel (forest fruit sprinkles), rimboehagel (jungle sprinkles), extra pure hagel (extra- dark chocolate sprinkles), XXL hagel (extra-large chocolate sprinkles) and sprinkles containing less sugar. You might think only children are mad about hagelslag on buttered bread. The truth is, it's extremely popular with adults as well. It's an iconic Dutch food that hearkens back to one's childhood—a comfort food of sorts. Some adults won't travel abroad without a package of hagelslag tucked in their suitcase. These sprinkles are popular in the Netherlands, Belgium and some of the former Dutch colonies of Suriname, the Dutch Antilles, and Indonesia. In Belgium, the chocolate variety is known as muizenstrontjes (mouse droppings). Another moniker for the chocolate variety is chocoladehagel (chocolate hail).